Summon your mummy's little mummy minion. 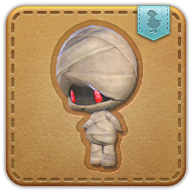 While as cute as a button, remember, mummies are ultimately embalmed corpses damned to eternal thralldom in the land of the living. Have fun. It is believed that the ancient technique of mummification─which involved embalming, organ removal, wrapping, and the burial in a multilayered sarcophagus─was an expensive undertaking. That it was performed on a child can attest to his parents' devotion. Inflicts a weakness to <?0x48><?0x49>monsters<?0x49><?0x48> on all enemies within range.